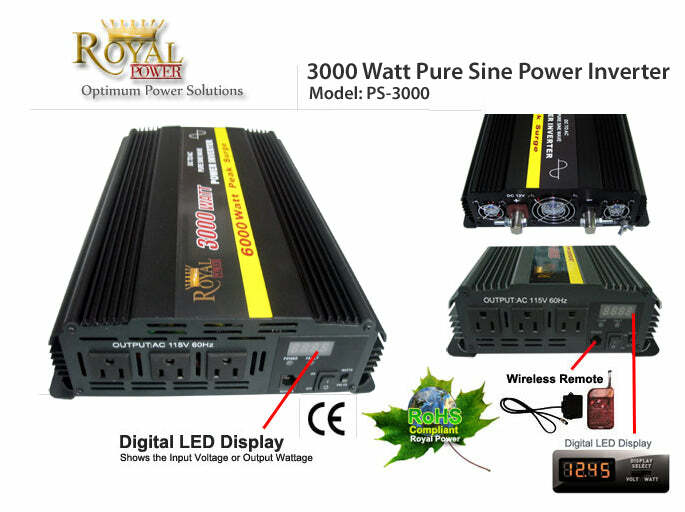 This 3000 watt 12 volt dc to 120 volt ac pure sine wave power inverter can handle loads as high as 24.25 amps. This is a pure sine wave power inverter which output a clean smooth wave of current. This type of current will allow you to run medical, audio and computer equipment with ease. with the use of a 12 volt battery power sources you converter that direct current into perfect 120 volt alternating current. 3000 watts of power will allow you to run a full range of power tools, heating equipment and high end audio systems. The PS-3000 includes digital monitoring which allows you to observe the battery voltage levels and wattage loads applied to the unit. This power inverter has three standard outlets and wireless remote input. 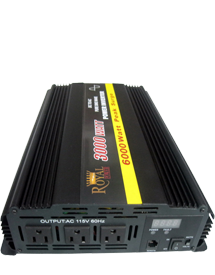 This 3000 watt inverter plugs directly to a 12 Volt DC battery to power large appliances, air conditioners, heavy duty power tools and many other electronics in your vehicle, or on a free standing 12V battery. This inverter also includes a USB port an excellent addition for battery chargers.